Cuckoo Clock with 8-day movement / running time (mechanical), with music and dancers, and a special wall board for the clock. This clock is one of our most impressive and beautiful models. The witch cottage with Hansel and Gretel coming out of the woods, mounted on a special wall board, is very impressive in any room! 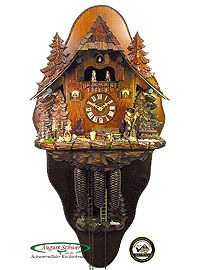 In reference to the Hansel and Gretel story, this clock has been designed and decorated like a real witch cottage right from a fairy tale. Surrounded by lots and lots of trees, the clock house with its pointed roof appears to stand right in the middle of a deep forest. Even behind the clock, two very large trees frame the clock against the background. This is a very unusual way to install trees on a clock and extremely rare! All around the clock are further trees, adding to the impression of a deep forest surrounding the clock. All figurines and decorative elements are made of wood and handpainted! Another eye-catcher is the beautiful slanted roof, just like a little forest cottage. It is tiled with individual wooden shingles, just like a real Black Forest farm house roof. All figurines, Hansel & Gretel, the witch, animals, dancing figurines are made of wood, and are hand-painted. Wooden dial, hands, cuckoo, pendulum. This clock comes with a wooden wall board. This is fixed on the wall and the clock is mounted on this wall board. This unique wall board adds to the impressive look of the clock considerably. It is 41.3 inches tall and 19.7 inches wide. In the lower part of the wall board is another decorative element. Here, another little bench is placed between two trees. International customers: This wall board is very large and thus extremely expensive to ship. Thus the very high shipping costs for this clock. The clock is a premium model: 5 years warranty, antique-style chains, wooden knob on night shut-off, real hinge on cuckoo door.